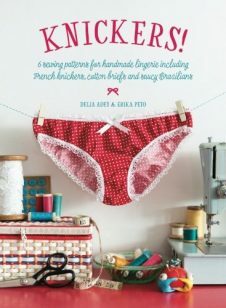 “Make your own knickers with this collection of flirty, frilly pants from Delia and Erika at Flo-Jo Boutique. Sewing knickers is the perfect quick to stitch sewing project and this collection includes six different styles of handmade lingerie for you to choose from. It also includes graded patterns for UK dress sizes 8-22. Delia and Erika’s patterns have vintage appeal with their sweet retro styling and cute design features including ribbon ties and ruching. Choose from Liberty print briefs, lacy cotton pants, French knickers and stretch lace briefs, amongst others. There is even a pattern for how to transform a silk scarf into the perfect pair of knickers. Why not host your own knicker party with friends, wine and this collection of handmade lingerie sewing patterns? Includes graded patterns for all the knicker styles at 50% or you can download full size templates at the link featured in the book. Happy sewing!” Order now.